Many of us used to convert YouTube to MP3 audio format because of its good quality and worldwide compatibility. However, MP3 is dead. As the successor of the MP3 format, AAC (Advanced Audio Coding) delivers better sound quality than MP3 at the same bit rate and successfully replaces MP3 to become the standard or default format for video streaming, music download, and radio broadcasting. 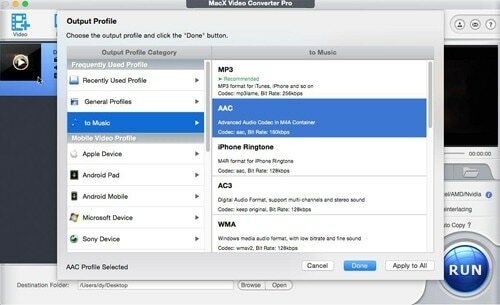 Now we should make some changes when it comes to extracting audio from YouTube files - convert YouTube to AAC instead of MP3. Here're top 3 ways to fast extract AAC audio from YouTube with the highest audio quality. If you are sick of ads and limits on online YouTube to AAC converter applications, and add-ons are too complicated to use due to the requirement for third-party help, the desktop software would be the best choice. MacX Video Converter Pro, a high quality and fast YouTube video downloader & converter is your best bet. * Download and convert YouTube videos to AAC, MP3, AC3, MP4, AVI, MOV, any audio video format. * Hyper-threading tech and High-quality engine help convert YouTube to AAC without losing quality in the fastest speed. * Download videos and music from 300+ sites, including YouTube, Vimeo, Facebook, Dailymotion and more. * Convert any video audio formats with 370+ video audio codecs built in. * No ads, no virus, no redirects, no limit on the number of videos you can convert. Launch the YouTube to AAC converter program on your computer (the latest macOS High Sierra and Win 10 also supported). Click YouTube URL at the top, copy and paste YouTube video URL to the box frame and click Analyze to let the software load the video. Choose YouTube video resolution, codec etc. to download after the video is loaded. It is able to download YouTube video of 4K UHD/1080p HD/720P/360P MP4, MKV, MOV, FLV etc. any format and resolution and convert it to AAC audio. Check the box "Auto add convert list", and click Download Now button at the bottom to start to download YouTube video. Once the YouTube video download process is completed, an Output Profile window will appear, allowing you to select profile format. Go to "to Music" > "AAC" and click Done to close the window. Then click RUN button to extract AAC audio from YouTube video. It's the same to convert YouTube to MP3 audio, WMA, AC3, iPhone ringtone format and other audio video formats. Also check out how to make ringtones for iPhone X/8/8 Plus etc. If you want to convert YouTube video stored on your computer, click Video icon at the top, select a source video to load, choose "AAC" under the "to Music" list, and click URN to convert YouTube videos to AAC. You can also use the YouTube to AAC converter to directly download AAC audio music from 300+ free music sites such as Audiomack, SoundCloud. It's not such a popular way to use an add-on to extract AAC from YouTube, but it does work. It can be hard at the beginning because most YouTube to AAC converter requires third-party help. But once the add-on works, you'll find it quite easy to convert YouTube to AAC audio on Mac, Windows or Linux. 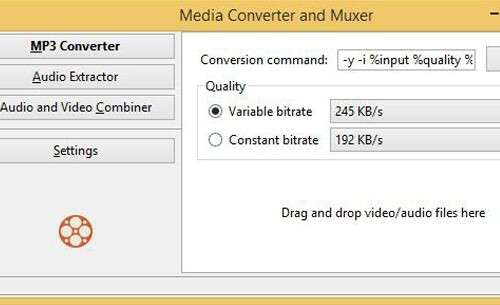 We pick out Media Converter here and show you how to use it. Also learn how to download YouTube Red to MP3 format. * Install FFmpeg on your computer. YouTube audio converter add-ons are just wrappers and need FFmpeg to do the conversion requests. * Install a native client to connect the add-on to the FFmpeg converter. Go to its website to find the native client download links for Mac, Windows or Linux. Be patient since you may encounter problems during the third-party software download process. Good luck. Step 1: Go to Mozilla Store, find the YouTube to AAC converter add-on, click "Add to Firefox" button to install the tool. If you want to uninstall it, go to Firefox > Add-ons > Extension Name, and click Uninstall button. Step 2: The add-on icon will appear in Firefox toolbar. Click the button, and a conversion window will pop up. Step 3: Drag and drop YouTube video file into the popping-up window and the extension will perform the YouTube to AAC conversion request. If the source video is not downloadable, an error message will appear, "ffmpeg.js - to audio - could not predict output format." We have many online applications to choose for YouTube to AAC conversion task. It's simple and you don't need to shell out any money, though these sites are fiddled with ads, redirects, and misleading download buttons ads. Most of free online YouTube to AAC converter programs have limits on the numbers and file size of the YouTube videos you can convert. Here we'll show you how to convert YouTube to AAC on Mac/Windows etc. using YouTube AAC. Step 1: Go to the website of the free online YouTube to AAC converter also a YouTube offline downloader, and open the video from which you want to extract AAC audio on YouTube. 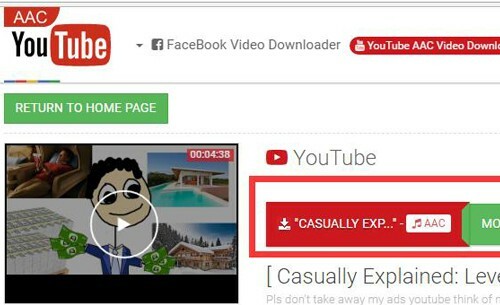 Step 2: Copy and paste the YouTube video URL to the box frame. Select AAC under the Conversion Format list. Step 3: Click Download button to start processing YouTube to AAC conversion. This may take several minutes. Step 4: Once the video is analyzed successfully, you'll see the video title at the top. Click the red download button to start to download the converted YouTube to AAC audio file to your computer. Note: we are talking about converting non-copyrighted YouTube clips to AAC for personal use. It's illegal to download copyrighted YouTube videos without the permission of copyright owners. Free download the best YouTube to AAC converter - MacX Video Converter Pro to fast convert YouTube video of MP4, MKV, FLV, HEVC, WMV, MOV etc. to AAC audio without audio quality loss.